To be frank, I’m done with winter and couldn’t be happier that spring has finally sprung! The colder months have left my skin looking very sad for itself; it’s dry, slightly flaky, oily, (confused) and very dull. So today, I’m sharing with you three products I reach for to get that faux spring glow. Before you apply your base of choice, opt for a brightening primer like the trusty cult classic Clarins Beauty Flash Balm - a multitasking radiance booster, aka the ultimate pick me up. It moisturisers (hydrated skin glows), tightens, brightens, preps the skin for makeup, diffuses pores, fine lines and wrinkles, all whilst leaving the skin looking fresh and radiant, without a hint of glitter. It’s an award winner for a reason ladies. Grab your favourite highlighter and create an instant glow by sweeping it across the parts of the face where the sun naturally hits. The best way to do this, is to apply it onto C-plane (from the top of your cheekbones to your brow bone). I also like to apply it into the corners of my eyes and onto the bridge of my nose, brushing it downwards so it hits the top of my cupids bow and my chin. Next contour the hollows of your cheeks and all the way along your hairline and jawline. This will help your highlight pop even more and give definition to your face. I like to use my CT Filmstar Bronze & Glow, a beautiful compact that offers two finely milled, super soft, silky and very pigmented powders. The highlight is a beautiful golden champagne colour, which isn’t at all metallically, or shimmery. It’s just b-e-a-utiful. Forget applying your favourite fake tan to your face. 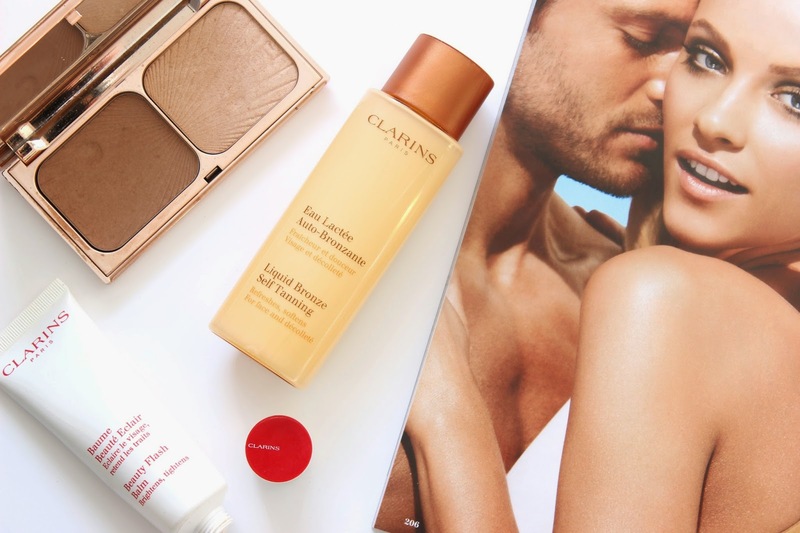 Switch to the award winning Clarins Liquid Bronze and wake up to a natural sun-kissed glow. The nourishing tanner has been specially developed to be used on your face. It warms up the skin, helping to disguise redness, scaring and minor blemishes. The product is light, refreshing and milky and application is effortless. Apply after cleansing, before bed and sweep a ten pence amount all over your face and wake up looking pretty darn fabulous. "On Wednesdays We Wear Pink!"